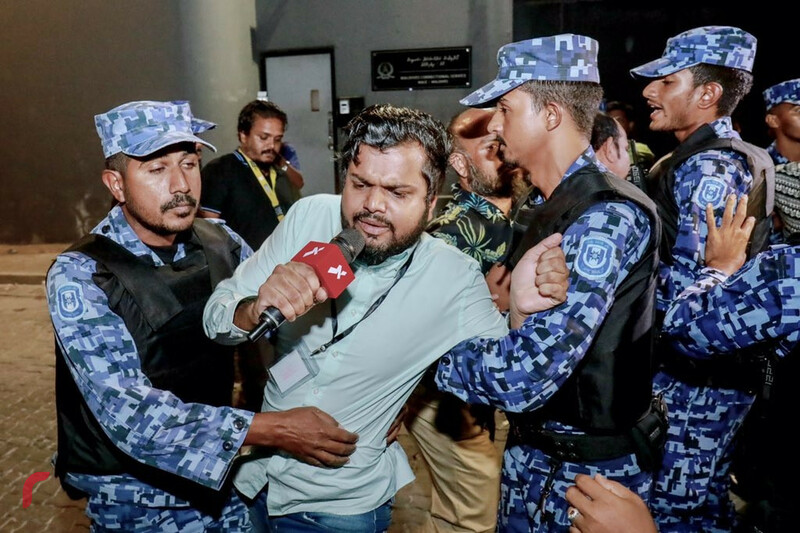 Committee to Protect Journalists (CPJ) says they are deeply concerned over arrests of VTV's Leevaan Ali Nasir and RaajjeTV's Hussain Hassan and reports that Hussain 'was badly beaten while in custody'. 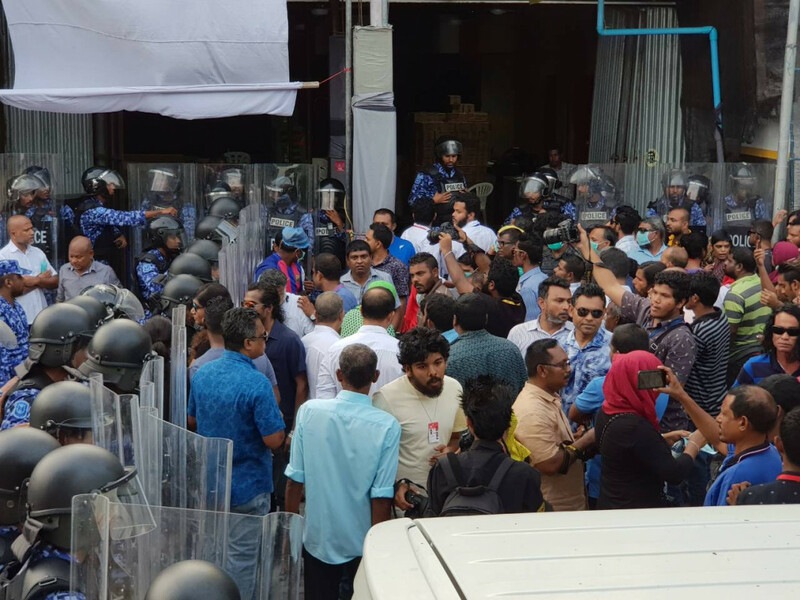 In a tweet posted early on Saturday morning, CPJ called on the Government of Maldives to cease all threats and voilence against journalists immediately. RaajjeTV's Hussain Hassan has been released from Police custody. Doctors say that he needs to stay at the hospital for 24 hours for additional observation. VTV journalist Leevaan Ali Nasir released from Police custody. RaajjeTV's Hussain Hassan is still in ADK Hospital for treatment. Reporter Hussain Hassan is in critical condition, unable to breathe properly and he has reportedly been tortured to a great extent. Lawyer Moosa Siraj while speaking to RaajjeTV reported that Hussain is in a very critical condition, he reported that Hussain was evidently grabbed by the neck and dragged away by the police, he is seen motionless in the video. 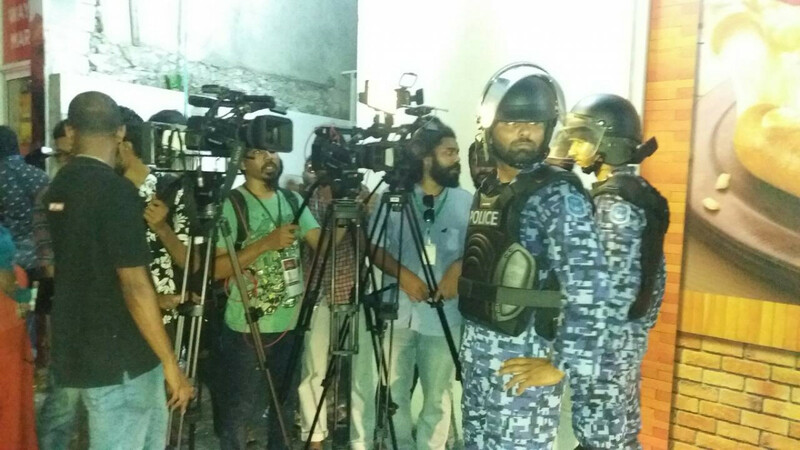 RaajjeTV reporters at the scene have again been heavily pepper-sprayed by the police. 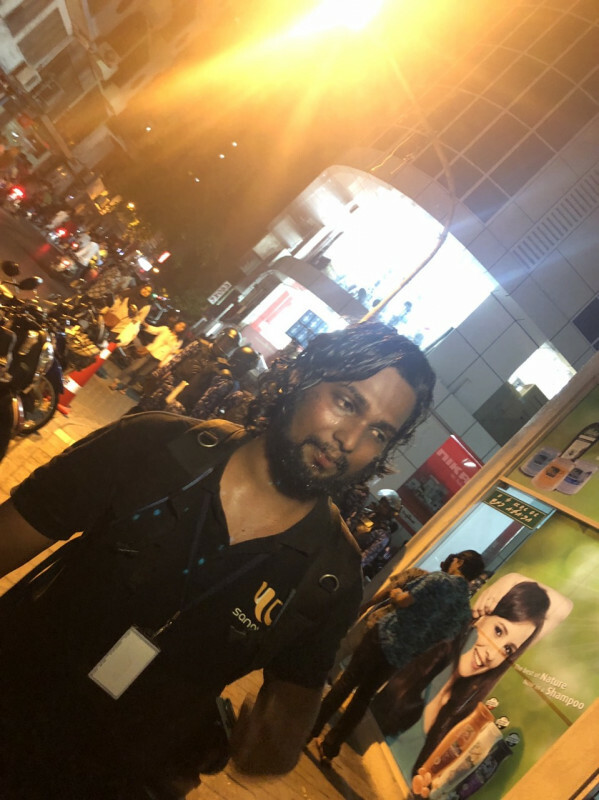 RaajjeTV's reporter Murshid Abdul Kareem has reported that cameramen Zareer, Nadheem and Saaif have been pepper-sprayed at a close promixity to the eyes. Reporter Murshid has also been somewhat affected by pepper-spray. While the protests have almost moved to the approximate center of the city, the area is becoming more and more congested. A fierce verbal battle has erupted within the government supporters and the opposition. 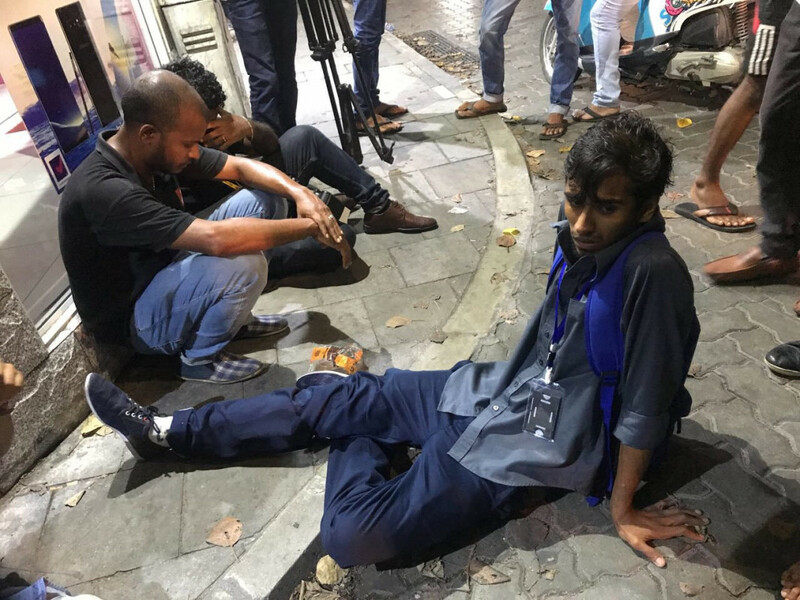 While reporters Leevaan Ali Nasir (V media) and Hussain Hassan (RaajjeTV) have been indefinitely seized, RaajjeTV's reporter who was immediately dispatched to the area reported that Jumhooree Party's translator Ali Solih was heavily pepper-sprayed and seeks medical help in IGM hospital while RaajjeTV's photographer Sharuhaan seeks medical help at ADK hospital. While media freedom was being heavily restricted by the police, the channels that praise and show their solidarity for the government were allowed to cover the rally without any restrictions. RaajjeTV's reporters were assaulted and arrested in the most cruel manner not long after PPM's prime minister Abdul Raheem Abdulla called to take action against the station. In a press conference held by PPM on the 16th of February Friday, Abdul Raheem specifically singled out RaajjeTV and V media, accusing the channels of unfurling chaos and disruption, he also called on action to be taken against the channels. RaajjeTV journalist Hussain Hassan has been seized. Journalists at the scene report that he was captured in an inhumane manner while he was reporting on field and his mic was snatched from him. Reporters have been heavily pepper-sprayed yet again, Special operations officers have attacked reporters in a cruel manner. Speaking on a live program RaajjeTV's cameraman Adam Zareer reported of the cruel and offensive actions of the officers, noting the sickening manner in which the media was handled, touched in vulgar manners and assaulted. V media's journalist Leevan Ali Nasir was captured along with Hussain Hassan. RaajjeTV's Cameraman Anil and photographer Sharuhaan have been severely injured by pepper spray and unneccesary assaults. "MDP activist Rasheed Moosa is being arrested by the Police. Where are the fundamental rights of the Maldivians?" tweets the JP secretariat. Fonadhoo constituency member of parliament and prime leader of the ruling progressive party of the Maldives (PPM) has bluntly stated that the biggest "plaque" the country faces is Jumhooree party's leader Gasim Ibrahim. Galolhu south constituency member of parliament Ahmed Mahloof has been arrested in front of Campus shop on Majeedhee magu. in the later hours of the night of the 16th February Friday, it was seen that the police have been using excessive force to restrict media freedom. 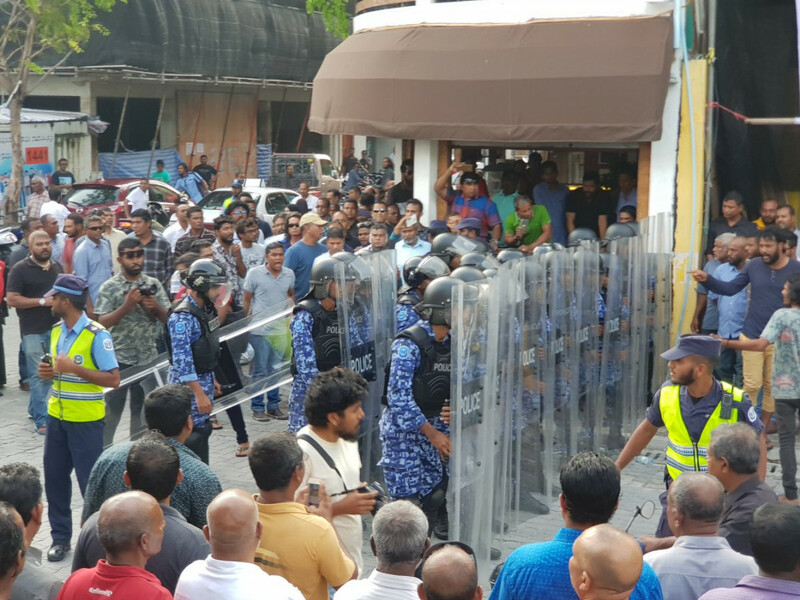 While the protesters gathered at the junction where Majeedhee Magu and Chaandhanee magu meets in the late hours of Friday, police continued their authoritative actions and RaajjeTV's reporter Hussain Hassan had noted that the police had used excessive force and attacked some protesters, one cameraman from SanguTV named Ahmed Ayad had his jaw bruised. The former president's tweet reads "Maldivians never give up. Even when pushed into the sea." The opposition are now gathered at the junction where Chaandhanee Magu and Majeedhee Magu meets. RaajjeMV's reporter Mohamed Fazeen has been heavily pepper sprayed in the eyes and SanguTV's reporter Yameen had been heavily tear-gassed. Reporters have been injured to some extent. Hithadhoo north constituency member of parliament Ali Nizar sent out a tweet at 2156, his tweet reads "Taken refuge from the Sea." 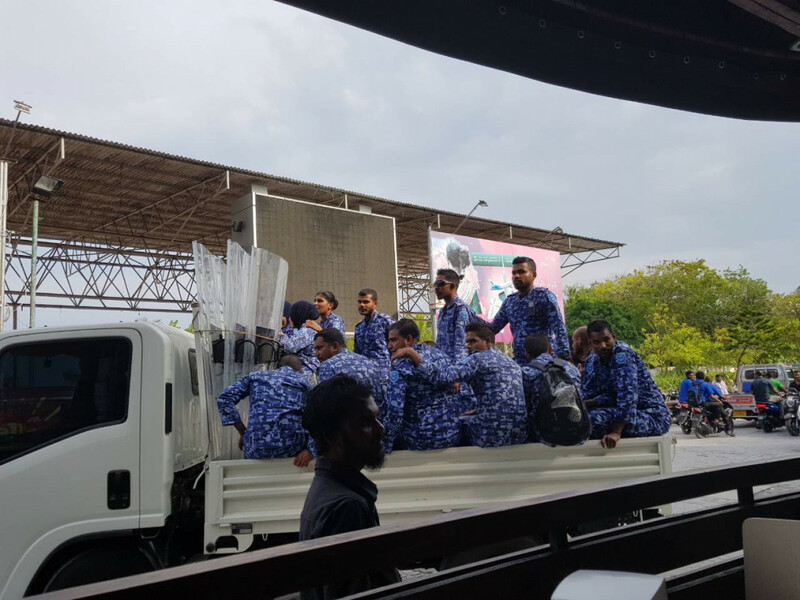 As the protesters were seen pushed back by the police ranks, they were shortly seen leaving the Artificial beach area and heading to the streets. 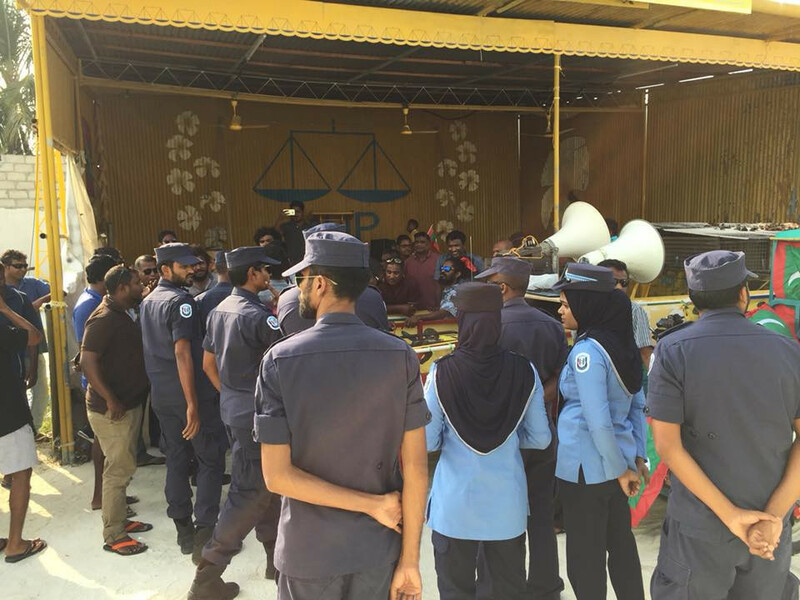 The protesters and media reporting the situation from where the protests are taking place in the Artificial beach area are being pushed back by the police with the force of their shields. 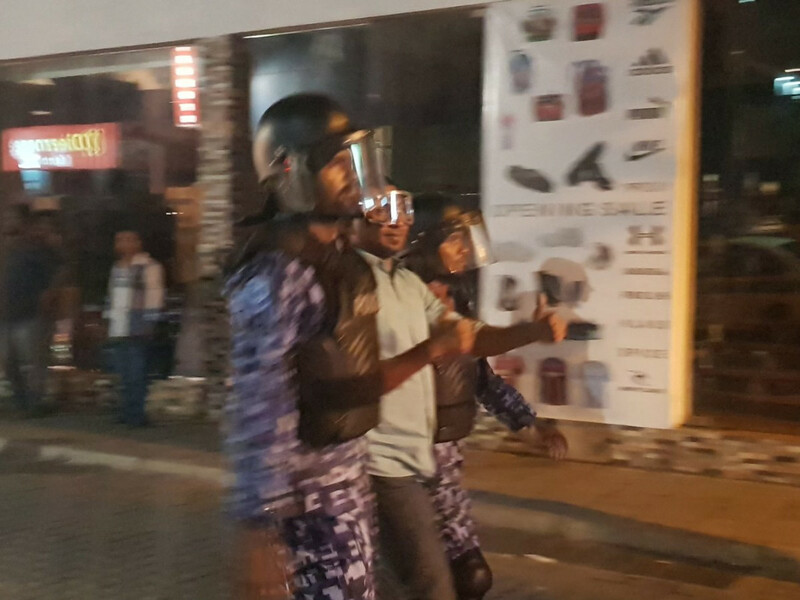 RaajjeMV's reporter has outlined that some are getting injured due to police actions. 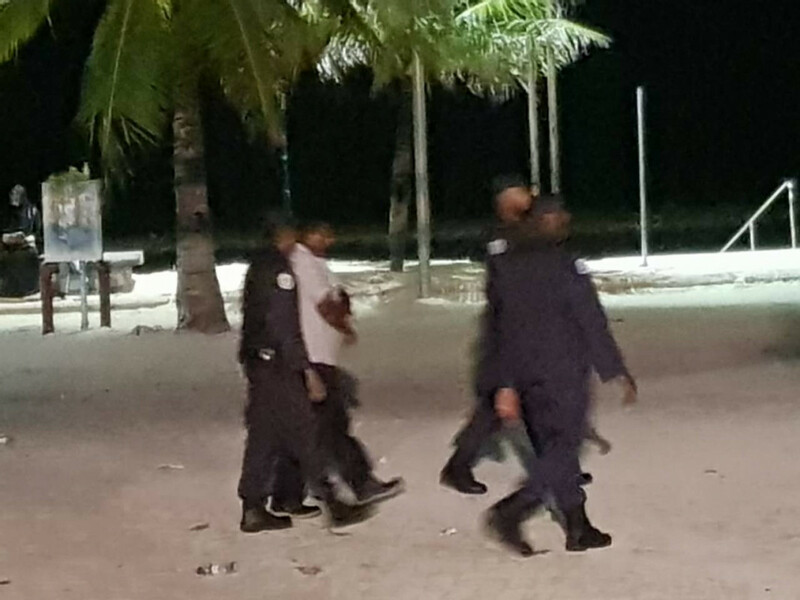 Galolhu south constituency member of partliament Ahmed Mahloof, who had taken part in today's gathering, has been released from police headquarters after having been taken there for a second time at 17:30, the first time being at 14:30. He was taken to the headquarters regarding a tweet he had sent out earlier. Mahloof has also noted that he has been told to present himself to Police HQ at 17:00 tomorrow. He also said that he will be there at the oppposition rally later tonight. The opposition have yet again started up their assemble around the Artificial beach area. The police are also working in the area. The protest which began in the evening today has been halted by the police and the protesters have been evacuated from the area. The opposition insists that they haven't yet brought an end to their protest and that the protest will reconvene within a short period of time. 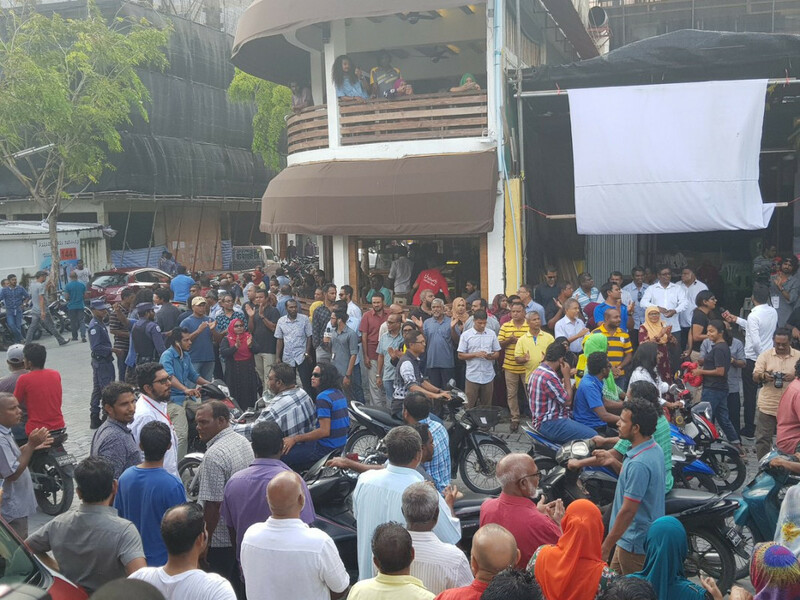 Citizens have taken to the streets to protest throughout the Maldives calling for President Yameen to implement the supreme court ruling issued on the unbiased remand of political prisoners. Here's what the former president tweeted regarding the issue. "Thousands protest across the Maldives against President Yameen’s refusal to enforce the Supreme Court ruling to release political prisoners. President Yameen must step down, allow for interim Govt to facilitate free, fair and inclusive elections in the Maldives." 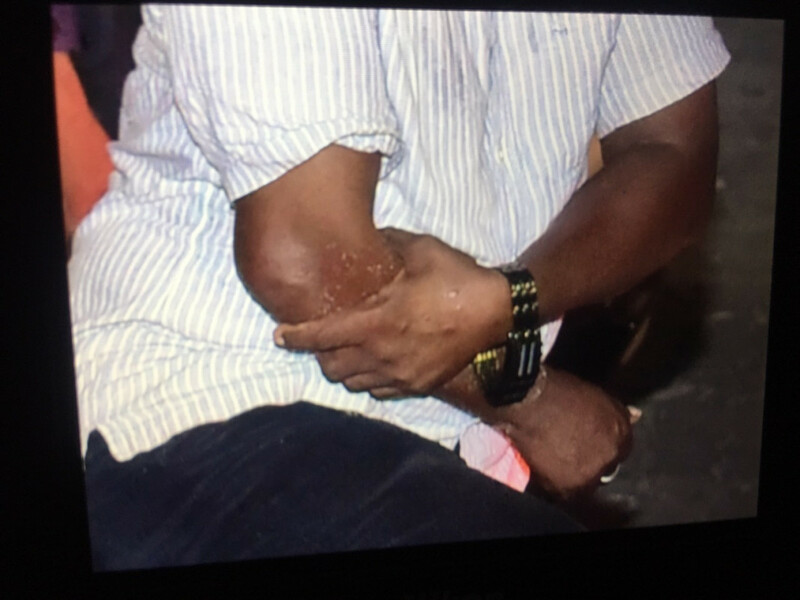 One of the protesters has had his arm broken during the protest that began this evening in the MDP national campaign house, sources report that the incident happened while the police were pushing the crowd back. It is yet unclear why the man got injured. The individual has been taken to ADK hospital. "The police have taken over the MDP’s national campaign centre, pushed those inside towards the road and blocked the entrance" says MDP. 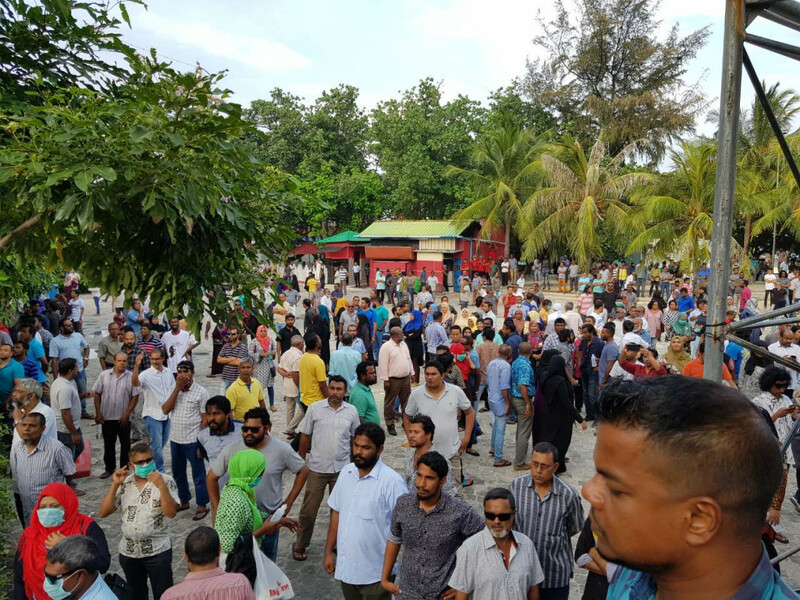 While many gathered at the Artificial beach area in Henveiru ward of capital Male' city this evening, opposition has claimed that they will not back down and will keep going forward with their protests. Crowd of protestors in Artificial beach area. This could possibly be the most harrowing president I have ever seen or heard of. I have never met or heard of a ruler who is as arrogant, conceited, inhumane and negligent towards running things legally and justly - tweets Jumhooree Party leader Qasim Ibrahim. Qasim Aduehi Adhi dhuh enme Aniyaaveri Veriakee R Yameen . mivaru dhogubunaa Aniyaaveri kamaa bodaakamaa kiburu veri rahumeh neiy laainsaaney Amilla edhumun furifaivaa Qanoon aa dheenah ves belumeh nethi Kankuramundhaa ehen meehaku ge Adeh nuivey adhi nudheken . 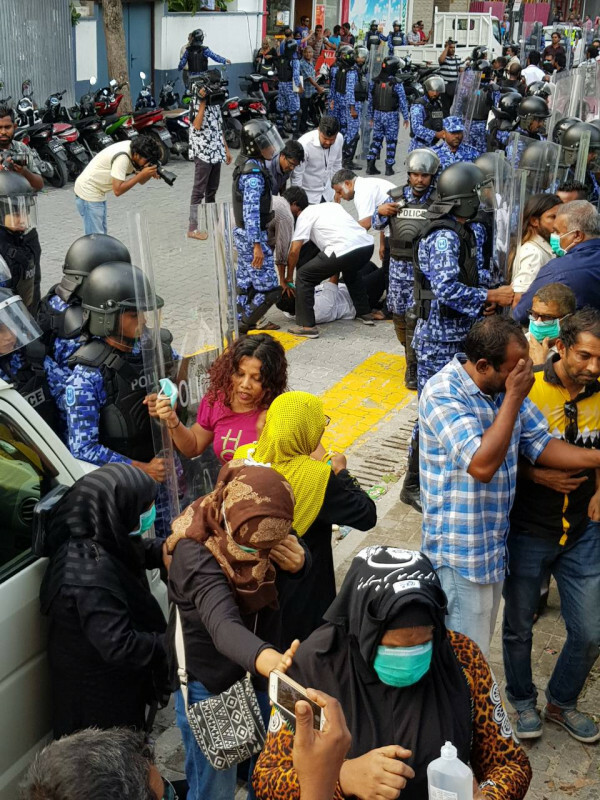 The police continue to restrict protesters, RaajjeTV reporter claims many have sustained minor injuries due to being pepper sprayed by the police. 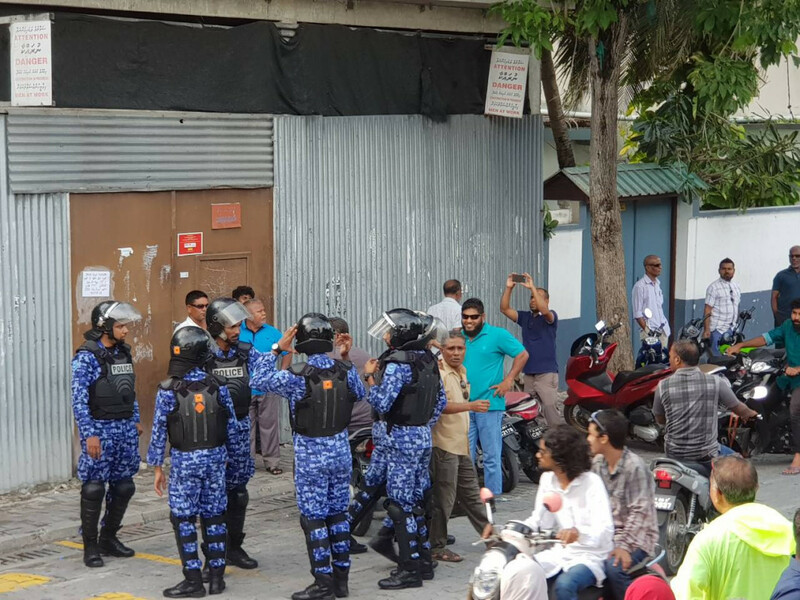 Police have assembled themselves where Majeedhee Magu and Boduthakurufaanu Magu meet, seen armed with shields. 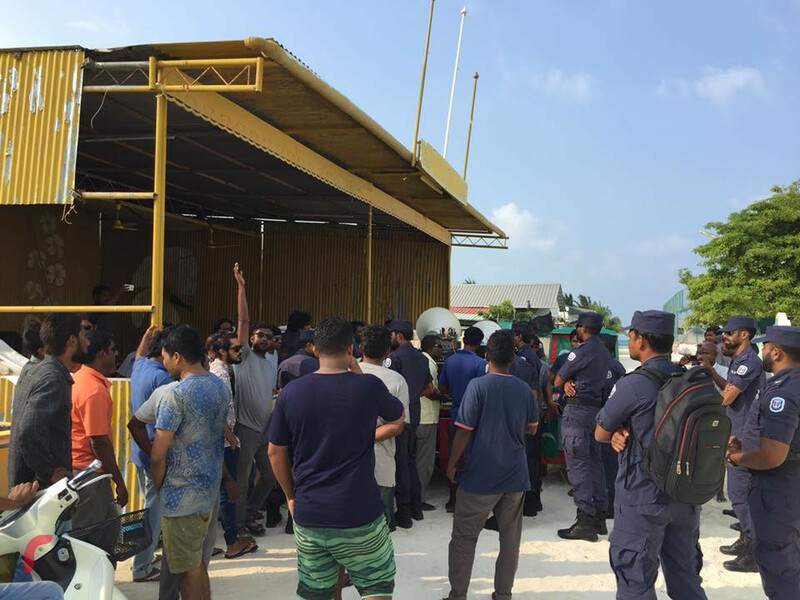 Police have begun to disband the protest being held in Thulhaadhoo island of Baa atoll by the opposition. 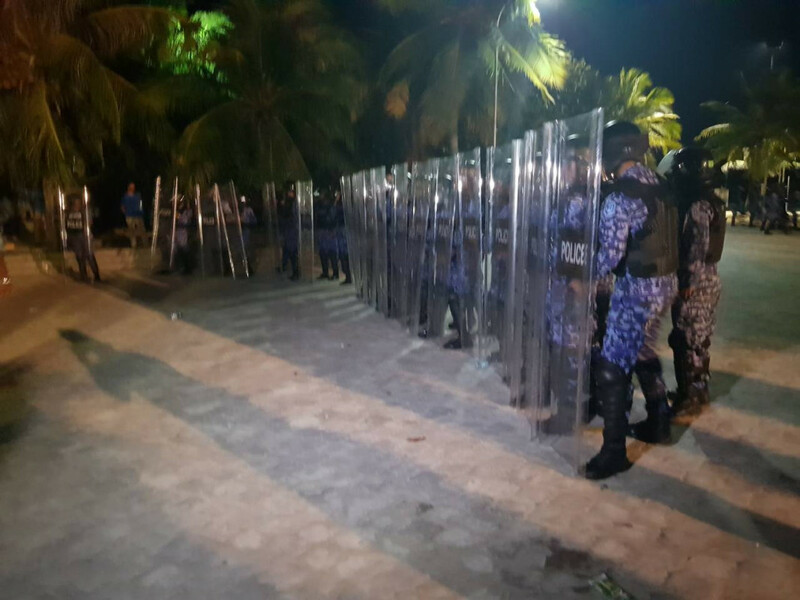 Armed with shields, police have formed ranks infront of MDP Haruge where opposition continues their protest calling for the implementation of the supreme court order. 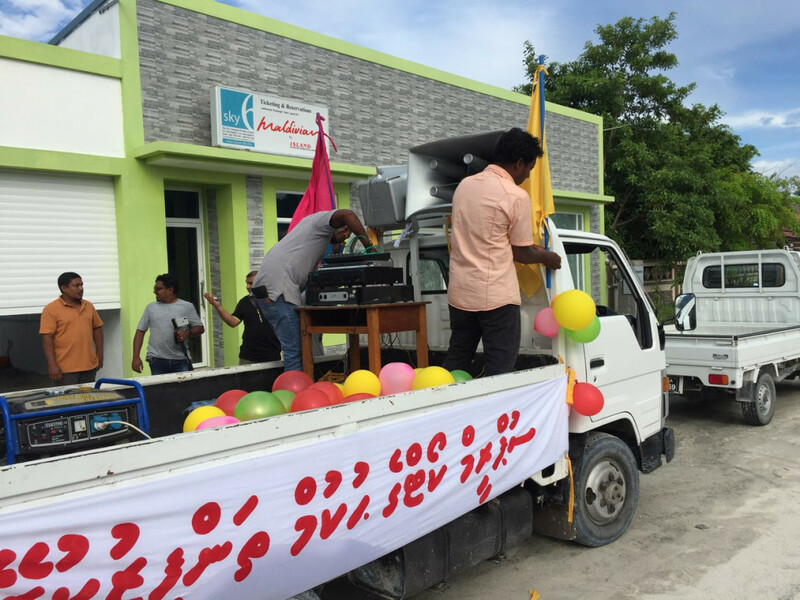 The warm up rally underway to commence in Thinadhoo Island. Final preparations begin. 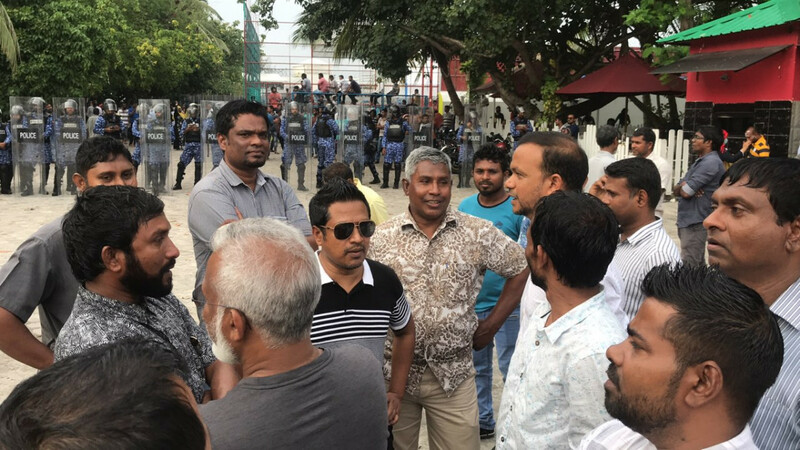 Maldives Police Service (MPS) has arrested Maldivian Democratic Party (MDP) Deputy Leader Mohamed Shifaz, the Party's Economic Committee Chair Amru and several others from MDP campaign house. 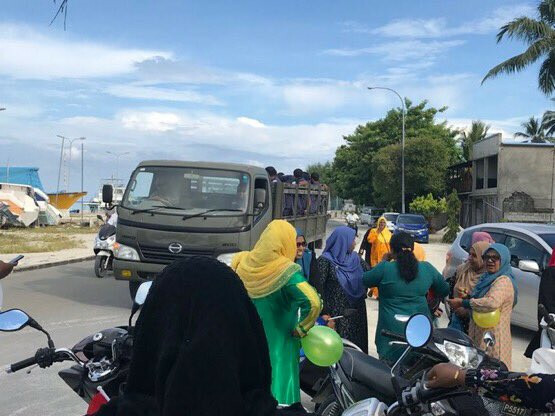 Addu city's MDP office has declared that preparations are underway for the warm up protest that has been planned for Friday evening in their support for the calling for immediate implementation of the supreme court ruling issued on the 1st of February. MDP's Addu city President, Ahmed Adhuham has been arrested. According to Adhuham's wife Shahuma's tweet, her husband was arrested near the MDP haruge at around 2pm. The family has not yet been informed of the reason behind his arrest. The opposition has stated that the gathering that the political parties are holding are not significant rather a "warm up" for what's coming. They have also called on the public to take part in the gathering to be held in capital Male' city and throughout the atolls on Friday. 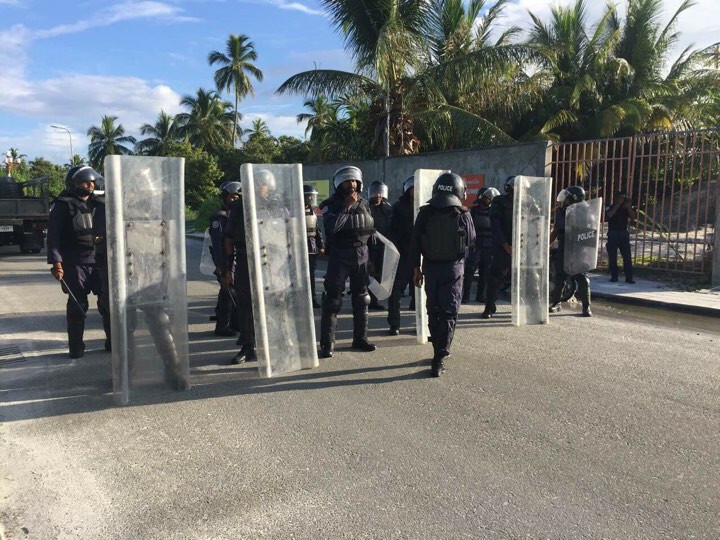 The police have claimed that the gathering cannot be perceived as that of a peaceful one and that they will take measures to not let the gathering go down. The joint opposition is to hold a special 'warm-up' rally on Friday evening. However, police has said that they will not be allowed to hold the rally, claiming that 'this is not believed to be a peaceful protetst'. 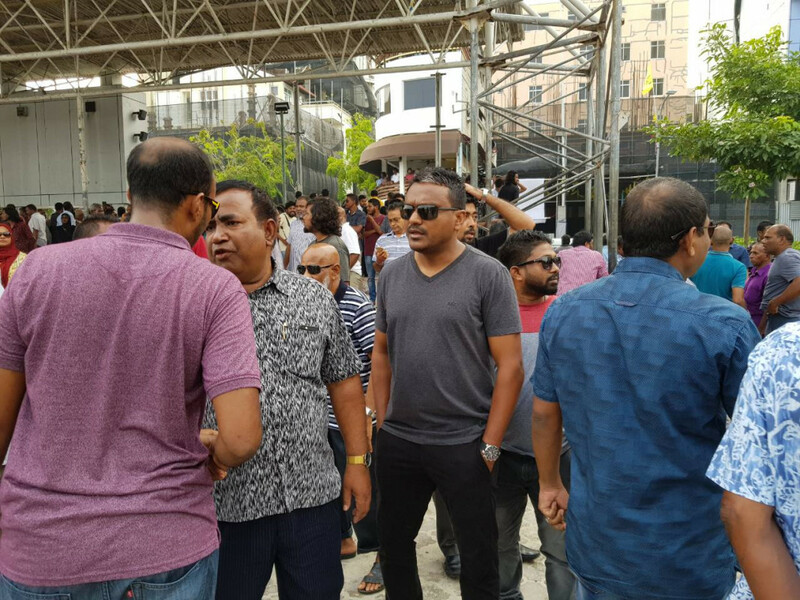 The opposition has been holding nightly rallies since February 1, when the Supreme Court issued its controversial ruling freeing nine high-profile figures including former President Mohamed Nasheed. President Abdulla Yameen refused to implement the order, and instead declared a state of emergency five days later. The joint opposition calls on all its supporters to take part in Friday's rally, which is also to take place in various other islands including Addu City and Hinnaavaru of Lhaviyani atoll. Galolhu-South constituency MP Ahmed Mahloof presented himself to police at 3pm. He was summoned there for questioning on Thursday as well, and is to submit himself at 5pm today again.